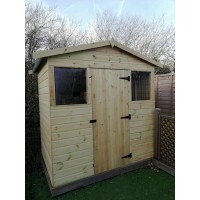 Made from the highest quality timber, from the smallest garden to the largest TJ's are guaranteed to meet your needs. The summerhouses can provide additional informal dining or a piece of haven to curl up and read a book. The timber that the summer houses are manufactured from is tongued and grooved and planed, they are treated with an water based treatment which will provide protection against decay*. Delivery and fitting on the Summerhouses is 5 - 15 working days. ** Please see terms and conditions for additional information regaarding installation. If your post code is out of area please get in touch to receive a quotation for fitting. 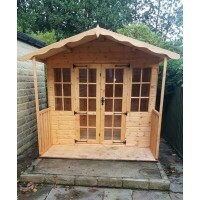 The Country Cabin Summer House is available is a traditional summer house for your garden The sum.. 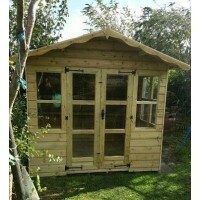 Treated Timber Optional verandah 2ft or 3ft .. The Devon Apex is a modern Summerhouse with large windows to the front with optional windows to the .. The Devon Pent is a modern Summerhouse with large windows to the front with optional windows to the ..
Georgian Style windows Antique Hinges Side Windows 2ft Verandah Apex only 3ft Verandah Ap..
Pressure Treated Timber Available in 16mm Tongued and Grooved board Low pitch roof 2" x 2" ..
​The Octagonal Summer House is an elegant Summer House for any sized garden. It is available in t.. The Georgian Summer House is a stylish building to suit any sized gardens. The summer house is av.. 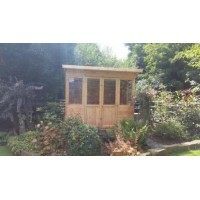 The Traditional Summer House is a stylish building to suit any sized garden. The summer house&nbs.. Treated Timber Includes fitting* Verandah sizes 2ft or 3ft * see termsand conditions .. 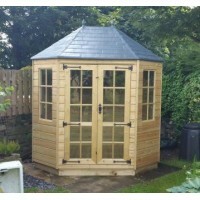 The Corner Summerhouse is a stylish building to fit neatly in the corner of any sized garden The .. Treated Timber Available in 16mm Tongued and Grooved Board, 19mm Barrel Board or 22mm Tanalised..